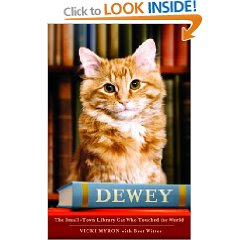 Yeah yeah yeah, I know the joke probably writes itself - a librarian reviewing a book about a library cat on a library blog. However, I'm a sucker for a decent animal memoir, even though 9 times out of 10, the animal in question usually dies at the end. And so, because I really enjoyed Marley and Me, I decided to give Dewey a shot. So I guess I perpetuate the stereotype after all. Shut up.